"...and into the forest I go, to lose my mind and find my soul." 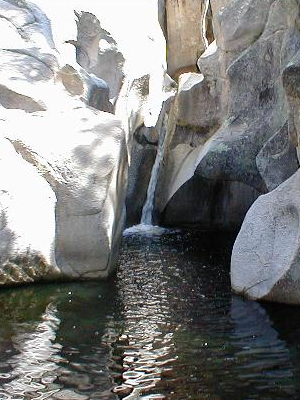 Lovely Lemmon Pools is tucked away in the middle of the Santa Catalina Mountains, not too far off of the Wilderness of Rocks Trail. It's hard to believe you're only a few miles from Tucson, because everything seems a world away once you're up there. Please join me for an easy two-night backpack to this wonderful wilderness area. We'll start mid- to late morning on the hour-long drive up to Marshall Gulch on Thursday. The trickiest part of the trip will be finding a parking spot at the trailhead. From the Marshall Gulch Trailhead, we have an easy hike of just over a mile up to Marshall Saddle. We'll pause there for a quick lunch break, then head to our campsite a few miles down the trail. If we're feeling a bit more energetic, or if we're unable to secure parking at Marshall Gulch, we may begin at the Sunset Trail trailhead rather than at Marshall Gulch. That would add 1.6 miles both outbound and on the return trip, as well as adding 200 feet of elevation gain each way. On Friday, we've got a very relaxing day. We'll have breakfast, clean up and secure our camp site, then hike just over a mile down the mountain to Lemmon Pools. I have the GPS track from previous trips, and hope that I can find the little route and the actual pools. I'm sure I won't have too much trouble. We'll relax at the Pools - the air and water temps will probably be much too cool to swim, but it's a lovely area - and probably have lunch there before heading back to our campsite. Be sure to bring a book for a long, relaxing afternoon in camp. If we're feeling particularly rambunctious, a hike up to Lemmon Lookout might be made part of the plan. This would add just about four miles and about 2,000' of elevation gain/loss to the trip, but it's not out of the realm of possibility. Another alternative would be to wander down the trail into the Wilderness of Rocks area, which would add a few miles and a few hundred feet of elevation loss/gain to the hike. Our visit to Lemmon Pools could be done after this jaunt. We'll have a leisurely breakfast and pack up on Saturday morning then strike out for the trailhead. For a change of both views and pace, we'll take the Aspen Trail on the return hike. We'll probably stop at Lunch Ledge for a break. Once we've reached the Marshall Gulch Trailhead, we'll take a few moments to clean up then climb into our vehicles and head back to Tucson. This trip is planned for a limited number of only four or five people. There is no charge and no permit required for the trip. You will, however, need a permit to drive up the road and park at Marshall Gulch. You'll need food for two breakfasts, two lunches, and two dinners. There should be more than enough water in Lemmon Creek for our minimal needs. There will definitely be water in Lemmon Pools, in case of a shortage up above. No worries. I'll verify the water situation with the local ranger station before the trip if there are any doubts or concerns. The weather should be lovely in the Catalina's this time of year. You can probably count on daytime highs in the 60s with lows in the high 40s. Our campground is at about 7,200 feet, so it'll be a bit cooler than Tucson, perhaps by as much as 20 degrees. Pay attention to the spot weather forecast using the link above. You may be able to use a light bag, but will likely have to opt for a colder weather sleeping bag. Once we arrive back at the trailhead, we'll get out of our boots, change to cleaner clothes, and head down the mountain for the 2019 SAHC Spring Picnic at Rose Canyon Lake.